I had a fun session with a class of kindergartners bright and early Friday morning. We explored the world and books of children's author-illustrator Jan Brett. Her books are known for colorful, detailed depictions of a wide variety of animals and human cultures ranging from Scandinavia to Africa. 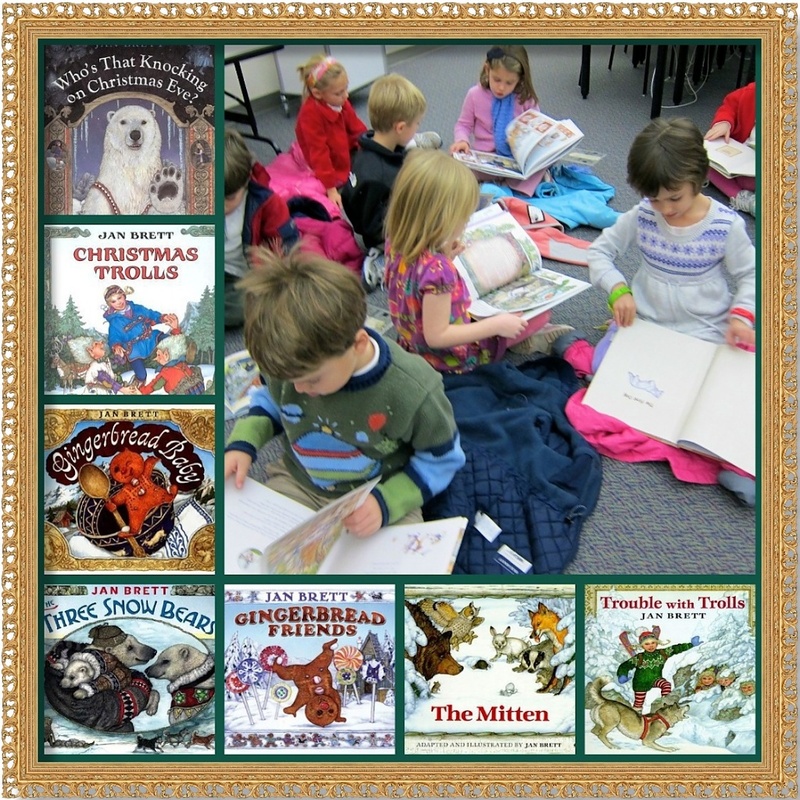 Some of her most popular titles have Christmas themes which made a perfect choice for today's class. We had enough of Brett's books that each of the 17 children could choose a book to look at and then trade with the other kids. We also visited Jan Brett's website and watched her bake gingerbread men. You can explore the world of Jan Brett for yourself at http://www.janbrett.com//. And if you are looking for a great Christmas book for a child, do consider any of the titles bordering my picture. All the children had their nones in the books..didn't they know you took there picture. a lovely collage. Fun collage and super creative idea. I love children's books, the illustrations are usually so cool. What a great collage, and it looks like the little ones are really enjoying themselves. Great collage, Allison! I *love* Jan Brett! The first book I ever bought Nique (she was five weeks old!) was The Owl and the Pussycat illustrated by her ... Then, she visited our school several years ago (about the time Hedgie went into space) and four of us had the opportunity to visit with her and her husband! @ZG How lucky are you! JB seems like such a friendly down-to-earth gal. I'd love to have her visit our school. I like the collage. I thought of you today when I attended a book fair at Sara's school. Wonderful collage! I love books!